It’s no secret that over the past ten days I have been sampling several nonalcoholic beers. I started doing this when I was hanging out with my husband for the second time this year at our favorite local watering hole, DJ’s. The first time, I drank several glasses of soda water mixed with cranberry juice. Frankly, I just couldn’t do that again. So, I tried a St. Pauli N.A. instead. I’ve never really been a beer drinker and previously had no reason to try nonalcoholic beer, so the whole beverage category is completely new to me. It was a surprise when I learned from two separate friends who responded to the Facebook photo of me with my St. Pauli N.A. that “nonalcoholic beer” is not nonalcoholic. That’s weird, isn’t it? It turns out that nonalcoholic beer is made the same way as regular beer and then the alcohol is removed afterwards. Evidently, the more alcohol you remove, the more expensive the process is. Even though brewers set out to take out the alcohol, it isn’t cost effective to do so fully and they do not want to guarantee that all of the alcohol gets removed. If you’re interested in knowing more about this process, take a gander at this article from Chow, my favorite online source for all things culinary, or Wikipedia. The FDA’s requirements for a beer to get the “nonalcoholic” designation are quite detailed and available here. The net-net is that the brewer has to guarantee that the alcohol percentage is less than 0.5% by volume. Since there is some alcohol, you have to be 21 in the U.S. to purchase or to be served nonalcoholic beer. Before you ask the inevitable question…No, I do not think I have broken my New Year’s resolution by sampling these NA beers. I figure that if pregnant women and on-the-wagon alcoholics can drink this stuff, so can I. Since it’s the football post-season and my team — the New England Patriots — is still in the running, I decided it was a great time for me to figure out which locally available nonalcoholic beers are the most enjoyable. This will allow me to make the most of not drinking all the way through to the Super Bowl. Only 3 nonalcoholic options were available at the three different local restaurants I visited over the past several days. These are O’Doul’s Premium, St. Pauli N.A., and O’Doul’s Amber. The tastiest and most drinkable of these three, by far, was the O’Doul’s Amber. The worst was St. Pauli. Frankly, once the glass was no longer cold, it was nearly undrinkable. Of the three, I could be very happy drinking O’Doul’s Amber at parties, watching games, and hanging out at bars – no problem. If all that’s available is O’Doul’s Premium, I would order it, drink part of it and let the glass sit there to look social. If my only option is St. Pauli’s N.A., I’d get the soda water and cran. Knowing that there are many more NA beers in the beverage category, I did some online searching to see which labels get the highest praise. This article from 11 Points and this one from Gizmodo were the most complete and helpful. Armed with this information, when I got into my local “beer cave” I knew just what I needed to complete my NA taste-testing: Kaliber by Guinness and the German import Clausthaler. I wish I knew more about beer so that I could accurately describe why these two beers blew away the others I had tried. There’s a lot in both the art and science of the taste of beer, or mouthfeel, as I discovered it is called, that I don’t understand. All I can say is the Clausthaler had a wonderful flavor with a bit of a citrus tang that makes it a great accompaniment to food, especially Asian or Mexican. And, the Kaliber has a very substantial body and good overall flavor that make it a great beer to drink on its own. I don’t expect to drink a lot more NA beer this year. However, I will definitely find a few occasions to fit Clausthaler, Kaliber, and even O’Doul’s Amber into my busy social schedule. 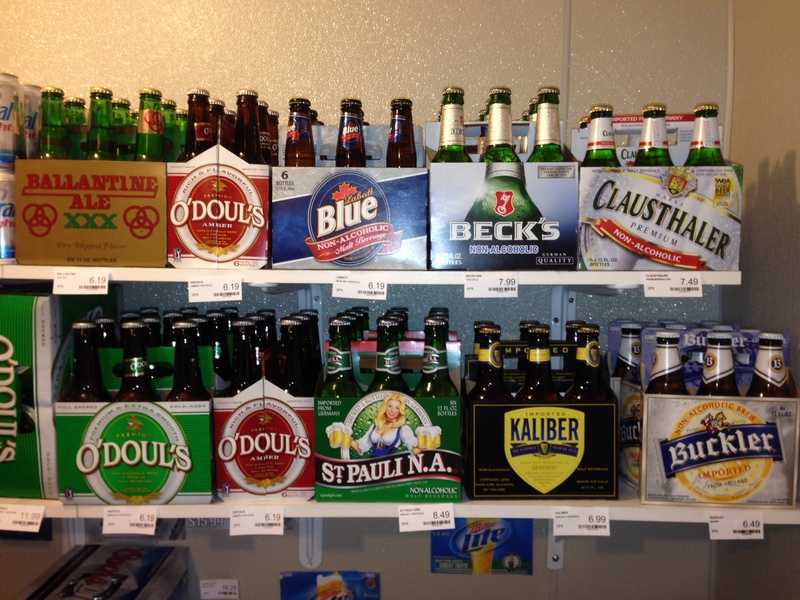 Actually, at least in VT you do NOT have to be 21 to purchase or consume NA beer, even the stuff with .5% or less. Most, if not all businesses refuse to sell it however to anyone 21 or under because the perception. Thanks, Darren. It looks like folks “card” for nonalcoholic beer in most states. I find your comment about VT and the law interesting, since I was carded at Rite-Aid on Friday when I bought NyQuil! That’s because NyQuil can be used to make meth, breaking baddie! I hit ‘enter’ too soon it appears…… In CONCLUSION….no laws govern it in many states but bars and retailers lump it in with alcoholic beers to ensure they are within the laws and don’t injure their reputations with the public. You might want to limit your visits to watering holes. Thanks, I have definitely cut back. These trips are just when I am going out for dinner with Bruce and he still likes to sit at the bar! That’s good to know, Sharon. I’m going to see if I can order those for the shop! Have you tried the Erdinger no-alc. beer?